I have all my best ideas when I'm so sleepy that I can't write them down. Then, in the morning, they're all gone! That was the case with what I wanted to get down about reading Sir Nigel. I've lost the words that can grasp how the novel combined the brutality of war with a sense of chivalry and romance. 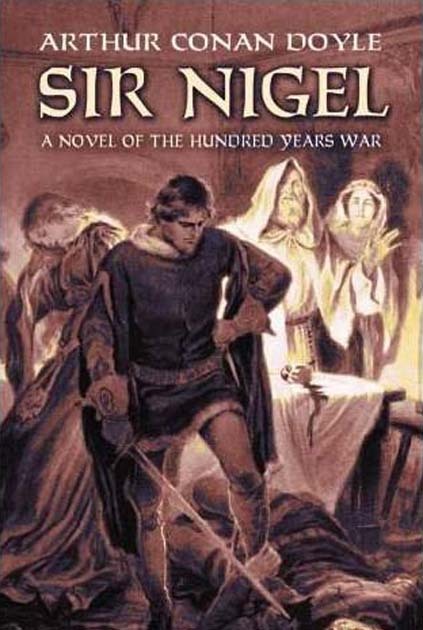 Sir Nigel, a young impoverished man of gentle birth, has no other desire than to fight for England. He has his chance when the King visits his home and he is made a squire to Sir Chandos, one of the bravest knights of England. War is never a pretty business, but Sir Arthur Conan Doyle infuses this story with Nigel's youth and innocence and his love for Lady Mary. Honor. Sir Nigel shows the worth of honor in 14th century England. A man's honor lies in fighting for England, for one's lady, or dying by the sword. To gain this glory, Sir Nigel takes a vow to do three deeds of honor for Lady Mary. Journeying through England, he fights battles against the French, Spaniards and all at Brittany always in the search for more honor. I loved the character of Sir Nigel and how his optimism, energy, chivalry and honor molded him into a great knight. The novel is a pleasant way to wile away the summer hours when there is no electricity to take your mind off the heat! This sounds like fun. I'd never heard of it before, but now I'll have to add it to my TBR list. It sounds like something my son might like too!